Labor Day is over and Fall is a few weeks away. Soon the leaves will change color and there will be a coolness in the air. The farmers will harvest the crops that they planted back in the spring. God created trees when He created the world and He designed them to change colors in the Fall. When you see a beautiful fall tree, do you think about God? The trees blaze with bold colors in the Fall and show us the power of our creator. A tree changes colors because God designed it that way. Everyone who sees the beauty of God’s Fall creations can see the beauty of God. If you were a tree, what would be the colors of your leaves? Would you shine boldly and would others be able to see Jesus through your colors? The Bible tells in Matthew that believers in Jesus will be known by their fruit. Matthew 7:9 Thus, by their fruit you will recognize them. Can others see Jesus in you? What fruit are you growing? When the farmers go out to harvest their crops, they will harvest exactly what they planted. A farmer who planted tomato seeds will not harvest a pumpkin! It is important that we plant good seeds – we need to study our Bibles and learn everything we can about Jesus. If we plant good seeds, then we will grow good fruit in our lives. Today, I will read my Bible. I will plant good seeds in my life so that I will grow good fruit. I will pray and ask God to help me grow strong in my relationship with Him. Please join with us in our Online Bible Study for Kids! “All About Jesus” Bible Study for Kids is an ongoing and interactive Bible study designed just for you kids. Kids from all around the world will be participating and you will have the opportunity to share and discuss God’s word with them. “All About Jesus” Bible Study for Kids is part of the “Homeschooled Kids Online” website and is the central and most important part of the site. We welcome you to join with us and have a blast learning “All About Jesus” and what He means to you and your life. 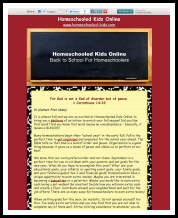 Joining with Homeschooling Families Since 1998!